On 31 August 2005, Tunbridge Wells FC and Littlehampton Town FC set an English record by taking an FA Cup penalty shootout to 40 kicks, almost doubling the previous record of 24. The sides met in the Preliminary Round of the FA Cup and drew 1-1 earlier in the week at Littlehampton, forcing a replay at the Wells' Culverden Stadium. They battled to a 2-2 draw (including two penalty kicks) through the end of extra time, then advanced to the shootout. Still level after five kicks, they kept going into sudden death and took 20 shots each before Tunbridge Wells emerged as winners by the margin of 16 to 15. Unfortunately, while Culverden has capacity of 3,750 (250 seated), only 122 fans were present to witness the record being set. As a reward for their perseverance, Wells moved on the Preliminary Round, where they were eliminated by Metropolitan Police FC, 2-0. 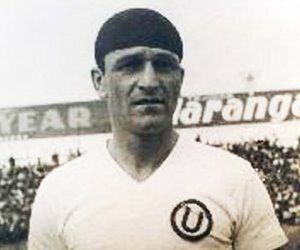 On 30 August 1953, forward Teodoro "Lolo" Fernández played in his last Peruvian Clásico derby, finishing as the rivalry's top scorer. It is only one of several scoring records held by Fernández. 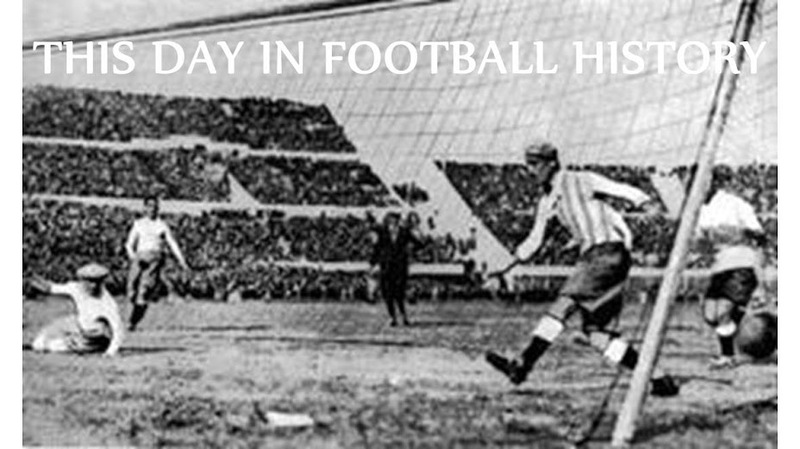 Peruvian clubs Universitario de Deportes and Alianza Lima have contested the Clásico since 23 September 1928, when Universitario staked a 1-0 victory. It was a heated match, with the lone goal coming from the penalty spot, while 5 Alianza players were ejected. Fernández signed with Universitario shortly afterward in 1931. By 1932, he was the Peruvian League's top scorer, a feat he repeated in 1933, 1934, 1939, 1940, 1942, and 1945. He also won six league titles (1934, 1939, 1941, 1945, 1946, 1949). During his tenure, Universitario played in 68 Clásicos, including league matches, cup competitions, and friendlies. During that period, Universitario won 34 and drew 11. In Fernández's last match, he scored a hat-trick to lead Universitario to a 4-1 win and reach his record of 29 Clásico goals. Despite the fierce rivalry, the Alianza Lima supporters applauded him as he left the pitch, perhaps grateful that their club would no longer have to face him in the derby. On 29 August 2009, Real Madrid began their second Galacticos period, opening their La Liga season at home against Deportivo de La Coruña. The match marked the first league appearance for their record £80 million signing, Portuguese winger Cristiano Ronaldo, who rewarded the Madrid faithful by scoring his first league goal. Ronaldo started the match alongside fellow Madrid debutants Kaká, Karim Benzema, and Xabi Alonso, all part of Real's €250M summer spending spree. It was veteran forward Raul, however, who put the hosts ahead with a 26th-minute goal. Ronaldo nearly doubled the lead three minutes later, but his header went over the bar. After Deportivo equalized in the 30th minute with a header from forward Riki, Ronaldo got another chance, as keeper Daniel Aranzubia brought Raul down in the box in the 35th minute and the winger converted the penalty kick. The visitors drew level again in the next minute, leaving Real midfielder Lassana Diarra to score the match-winning goal in the 60th minute. Labels: Cristiano Ronaldo, RC Deportivo de La Coruña SAD, Real Madrid C.F. On 28 August 1977, the New York Cosmos won their first Soccer Bowl, beating the Seattle Sounders 2-1. Playing before a crowd of 41,270 at the Civic Stadium in Portland, Oregon, the Cosmos capitalized on a mistake by Sounders goalkeeper Tony Chursky to take an early lead. In the 20th minute, Chursky collected a pass intended for Cosmos striker Giorgio Chinaglia and dropped the ball to the ground in front of him, unaware that NY winger Stephen Hunt was lurking nearby. Hunt stole the ball away from Chursky and poked it into an open goal to put the Cosmos up 1-0. The Sounders responded quickly, with former Cosmo forward Tommy Ord heading in an equalizer four minutes later. Both teams continued to attack, combining for 55 shots (29 from the Cosmos and 26 from the Sounders), but they scored only one more goal - a 78th-minute header from Chinaglia that was set up by a cross from Hunt and again put the Cosmos in front, 2-1. It was the first Soccer Bowl win for the Cosmos, but their second NASL title, since they had won the pre-Soccer Bowl championship in 1972. For his performance, Hunt was named the match's MVP. 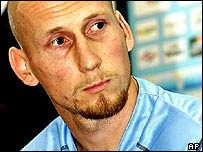 On 27 August 2001, Dutch center back Jakob "Jaap" Stam completed his transfer from Manchester United to Lazio for a United-record £16.5 million. The move was a shock to everyone, including Stam. Stam had arrived at Old Trafford in 1998 when United bought him from PSV Eindhoven for £10.6 million, making him history's most expensive Dutch footballer to that point. In his three seasons at United, the club won three Premier League titles, an FA Cup, and the UEFA Champions League. Individually, England's Professional Footballers' Association voted Stam to their Team of the Year for all three seasons. In the summer of 2001, however, excerpts began appearing in the press from Stam's upcoming autobiography, Head to Head, including criticisms of his United teammates and claims that United manager Alex Ferguson ordered his players to dive in European matches. He also suggested that Ferguson violated FIFA rules in purchasing him from PSV. Within two weeks after those stories broke, Stam found himself in Lazio. Ferguson claimed that Lazio's offer of £16.5 million - which more than doubled the previous record fee of £7 million received by United from Inter for midfielder Paul Ince in 1995 - was simply too good to refuse. In 2009, Ferguson admitted that Stam's transfer was one of his greatest mistakes, noting that the defender continued to play a top level for several years afterward. Stam eventually retired in 2007 after seasons at Lazio, Milan, and Ajax. On 26 August 2005, Australia's new football league - the A-League - kicked off with a pair of matches that involved half of the new league's membership. The A-League was founded in 2004 to replace the National Soccer League, which folded that year after 28 seasons due to financial difficulties. Four teams - Perth Glory, New Zealand Knights, Newcastle Jets, and Adelaide United - made the move to the new A-League and were joined by new clubs Melbourne Victory, Sydney FC, and Central Coast Mariners. The group of eight was rounded out by former NSL side Queensland Roar, who had been playing in the Queensland State League as the Brisbane Lions since 1988. On that opening day, Perth Glory hosted the Mariners, winners of the league's preseason Challenge Cup, while Newcastle hosted Adelaide. In both matches, the visiting sides won by identical 0-1 scores. It was a sign of things to come as both teams would enjoy success in that first season: Adelaide finished at the top of the regular-season table, while Central Coast advanced to the Final of the playoffs, losing 1-0 to the A-League's first champions, Sydney FC. On 25 August 1930, the Western Germany Football Association (the Westdeutscher Spielverband or WSV) banned fourteen players for receiving illegal payments. All fourteen players were from FC Gelsenkirchen-Schalke 04, who had won the regional Western Germany football championship in 1929 and 1930. The club had paid the players ten Reichsmarks instead of the allowed five for an away match, prompting the WSV to issue the ban. One of the banned players was striker Ernst Kuzorra, who played for Schalke from 1927 to 1950 and is regarded by many as the club's greatest player. The players were banned for the 1930-31 season, but were allowed to return the following season, when Schalke rattled off two more Western Germany titles (1932, 1933). But the effects of the ban extended beyond the pitch - eight members of the Schalke board were expelled from the WSV and club treasurer Willie Nier, who had attempted to conceal the illegal payments, committed suicide by drowning himself in the Rhine-Herne Canal. 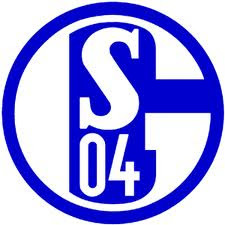 Schalke continued its successful run, winning seven German championships between 1934 and 1958. After a fallow period in the 1980s and '90s, they have returned to prominence, most recently finishing sixth in the Bundesliga. On 24 August 1949, Manchester United returned to Old Trafford, playing a League fixture there for the first time in over ten years. Old Trafford, nicknamed the "Theatre of Dreams," has served as United's home ground since 1910. But after the 1938-39 season, the FA suspended League play for the duration of World War II, with United's last match before the break being a 2-0 win over Liverpool. During the war, German bombing runs twice hit Old Trafford, rendering it unusable. As described by a report in the Telegraph, "The spectacular main grandstand lay in ruins, what was left of the vast, sweeping terracing was overgrown with weeds, a thorny 6ft high bush had sprouted in the middle of the scorched pitch, a couple of threadbare Nissen huts served as dressing rooms and offices, and the 'training pitch' was a levelled-off area of rubble behind the Stretford End; the 'Theatre of Dreams' was a landscape of nightmares." 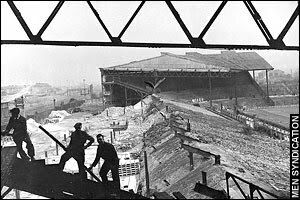 When League play resumed in 1946, United were still in the process of rebuilding the stadium (see photo). For the next three seasons, they played their home matches at Maine Road, the home of rivals Manchester City (£5,000 a year plus a take of the gate). By the start of the 1949-50 season, the stadium was not fully rebuilt, but was ready for play and 41,748 people showed up to watch United defeat Bolton 3-0. On 23 July 1910, Italian legend Giuseppe Meazza was born in Milan. He would go on the become the Italian national team's greatest scorer and a two-time World Cup winner. Meazza, who lost his father to the war in 1917, learned to play football barefoot on the streets of Milan. When he was 12, he began playing for local side Gloria FC and a fan bought him his first pair of football boots. He began his professional career in 1927 with Inter and was an immediate success, scoring a brace in his debut against Milanese Unione Sportiva. The following season, the first for Serie A, he scored 31 goals. He remained with Inter for 13 seasons, winning three Serie A titles (1930, 1938, 1940) and one Coppa Italia (1939). During that period, he joined the Italian national team, earning his first cap in 1930 and winning back-to-back World Cups in 1934 and 1938. In all, he scored 33 goals for the Azzurri, making his the national team's leading scorer until the record was broken by Gigi Riva in 1973. In 1940, he moved across town to Milan, where he played for two seasons. He later spent time with Juventus (1942-43), Varese (1944), and Atalanta (1945-46), before returning to Inter for one last season before retiring. He turned to management, starting with Atalanta, but also taking charge of Inter (on three separate occasions) and the Italian national team before retiring completely in 1957. He died in 1979 at the age of 68. The next year, Inter and Milan renamed their joint stadium after him. 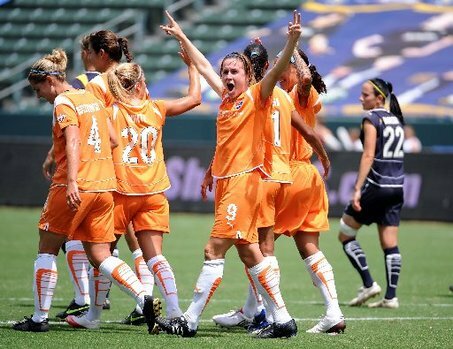 On 22 August 2009, New Jersey's Sky Blue FC and the Los Angeles Sol faced each other in the Final of the inaugural Women's Professional Soccer playoffs. The Sol, who had had beaten Sky Blue in the latter's opening match of the season, finished at the top of the regular league table, but Sky Blue won the rematch to claim the new league's first title. The top four finishers in the regular season qualified for the playoffs, which used an unusual format. The third-ranked team , hosted the fourth-place team, with the winner advancing to face the second-place team. The winner of that match then met the regular-season champions for the trophy. Sky Blue finished fourth, so had to defeat third-place Washington Freedom (winning 1-2) and second-place St. Louis Athletica (0-1) in order to play the Los Angeles Sol. Playing before a crowd of 7,218 at the Sol's home stadium, the Home Depot Center in Carson, California, Sky Blue played a strong defensive game to shut down Sol star Marta, the league's leading scorer. But when a deep throw-in early in the first half gave them a rare scoring opportunity, they made the most of it; defender Keeley Dowling's cross found Natasha Kai in the box, the striker headed the ball down to midfielder Heather O'Reilly (pictured, no. 9), who knocked it into the net off of Sol keeper Karina LeBlanc to give Sky Blue a 16th-minute lead. The Sol's chances were further frustrated in the 27th minute, as center back Allison Falk received a red card for a challenge on Kai. Down to ten players, the hosts were unable to mount a serious threat and the match ended 0-1. On 21 August 1965, Charlton Athletic midfielder Keith Peacock became the Football League's first-ever substitute when he entered their match against Bolton in the 11th minute. Unfortunately for Peacock, he replaced Charlton's injured goalkeeper and Charlton lost 4-2. For most if its existence, the League did not allow substitutions under any circumstances. But they decided for the 1965-66 season to allow a single substitution for injuries only. Charlton opened that season in Division Two away at Bolton and lost starting goalkeeper Mike Rose to an injury after only 11 minutes. Newly-appointed manager Bob Stokoe sent Peacock in and moved left back John Hewie into goal. Unfortunately for Charlton, the move did not prevent Bolton from winning by the score of 4-2. After two seasons, the League again changed the substitution rule to allow switches for tactical reasons as well as injuries. On 20 August 1960, Tottenham Hotspur opened their season with a 2-0 win over Everton, starting the journey that would end with a League and FA Cup double. Playing before a home crowd of 50,393 at White Hart Lane, Spurs - who had finished the previous season in third place, only two points behind League winners Burnley - created a handful of early chances, but were denied by Everton's goalkeeper, Albert Dunlop. The teams were evenly matched and appeared to be headed for a draw when Spurs center forward Bobby Smith was brought down in the Everton box. 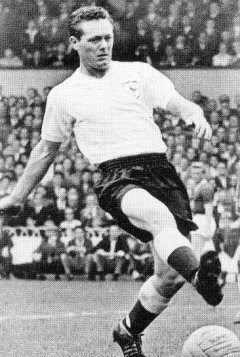 The referee played the advantage, however, as Tottenham inside forward Les Allen was in a scoring position and his ensuing shot put the hosts up, 1-0. Two minutes later, Smith doubled the lead with a low header and the game ended 2-0. The win sent Spurs to the top of the table, where they remained for the rest of the season to claim their second League title, ten years after their first. They capped the season with a 2-0 win over Leicester in the FA Cup Final at Wembley. Labels: Albert Dunlop, Bobby Smith, Everton F.C., Les Allen, Tottenham Hotspur F.C. On 19 August 2005, midfielder Michael Essien moved from Lyon to Chelsea. The £26 million transfer fee made him the Blues' record signing at the time and ended a three-month battle between the two clubs for the player's services. Chelsea first expressed interest in Essien in May 2005, the year Essien was named the Ligue 1 Player of the Year. They offered £10 million, but were promptly rebuffed by Lyon president Jean-Michel Aulas. In June, Aulas rejected a proposed swap deal involving recent Chelsea signee (and then-record transfer fee holder) Didier Drogba, joking that he'd be interested only if Chelsea had signed Samuel Eto'o or Adriano. By the end of June, Lyon rejected Chelsea's renewed bid of £16.75 million. 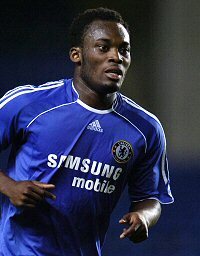 By July, Essien publicly stated that he wanted to make the move, saying "I have made my choice. I want to go to Chelsea." In response, Lyon set a £31 million price tag on him, plus a demand for a player in exchange. When Chelsea failed to pay by the beginning of August, Aulas hinted that Manchester United were also interested in Essien. A few days later, Lyon rejected an improved Chelsea offer of £21 million, plus Portuguese midfielder Thiago Mendes. By 12 August, it was clear that Lyon could not persuade Essien to stay. The club announced that he would sign with Chelsea for a £26 million fee - £2 million more than the London club had paid to acquire Drogba from Marseille. Essien's record did not last long, however, as less than one year later, they purchased striker Andriy Shevchenko from AC Milan for £30.8 million. Chelsea's current record for most expensive signing was set by the acquisition of striker Fernando Torres from Liverpool in 2011 for £50 million. 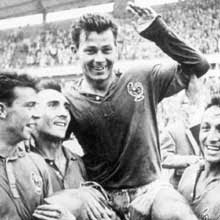 On 18 August 1933, French striker Just Fontaine was born in Marrakech, French Morocco. He is best remembered for his record-setting performance at the 1958 World Cup when he scored 13 goals - the most goals scored by an individual at a single World Cup. Fontaine started his professional career with USM Casablanca, but moved to France in 1953 to play for Nice. After three seasons, in which he scored 44 goals for Nice, he moved to Stade de Reims, where he won the 1958 and 1960 Ligue 1 titles. Before moving to Reims, Fontaine had been capped only once for France, in 1953 (though he scored a hat-trick in that debut). After one more cap each in 1956 and 1957, he had his annus miribilis in 1958 - scoring 18 goals in 12 appearances for the French national team, including 13 in that year's World Cup. 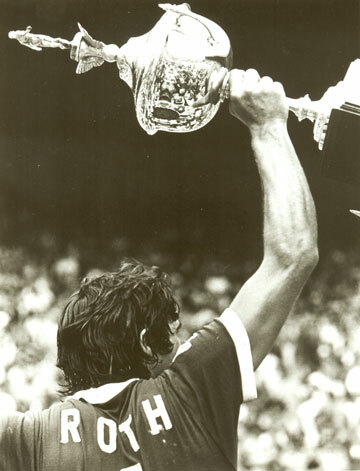 He scored four of those in the third-place match, as France defeated West Germany, 6-3. Despite the fact that he played in only one World Cup, those 13 goals tie him for the fourth most goals in World Cup competitions, with the three players ahead of him (Ronaldo, Gerd Müller, and Miroslav Klose) playing in multiple tournaments. He last played for France in 1960, and remained with Stade de Reims until 1962, when injuries forced his early retirement. On 17 August 1977, Thierry Henry was born in the Paris suburb of Les Ulis, Essonne. He would go on to be named a five-time French Player of the Year while also becoming the French national team's greatest goalscorer. Henry made his professional start in 1994 with AS Monaco, after being brought in as a youth player by then-manager Arsène Wenger. He helped Monaco win Ligue 1 in 1997, then advanced to the Champions League semi-final in 1998. He left Monaco in January 1999, transferring to Juventus for £10.5 million, but failed to settle in Italy and moved to Arsenal seven months later, where he was reunited with Wenger. 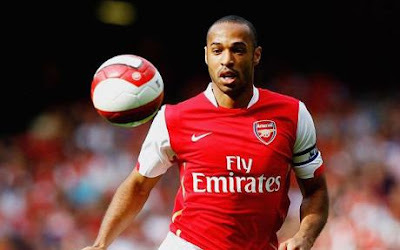 At Arsenal, Henry blossomed into a world-class striker, winning the Premier League's Golden Boot in four different seasons. He also helped Arsenal win two League titles and three FA Cups. In 2006, Henry and Arsenal advanced to the Champions League Final, losing 2-1 to Barcelona. He moved to Barcelona in 2007, where he eventually won the Champions League in 2009. Henry earned his first cap for France in 1997 and won the World Cup the following year. Before his international retirement in 2010, he scored a record 51 goals in 123 appearances for Les Bleus. Henry moved to the United States in 2010 and played for the New York Red Bulls until his retirement in 2014. On 16 August 1890, the Scottish Football League kicked off its very first season. It is the world's second-oldest football league, two years younger than England's Football League. Although the Scottish Football Association had existed since 1873, the teams competed in the Scottish Cup and in irregular matches among themselves. By 1890, interest in Scottish football had increased, so that the growing number of teams needed an ordered schedule. As a result, a group of eleven teams organized the Scottish Football League. The eleven were Abercorn, Cambuslang, Celtic, Cowlairs, Dumbarton, Heart of Midlothian, Rangers, Renton, St. Mirren, Third Lanark, and Vale of Leven. Scotland's oldest club, Queen's Park, were invited join, but declined. Four matches were played on that opening day: Rangers beat Hearts, 5-2; Celtic lost 1-4 to Renton; Cambuslang crushed Vale of Leven, 8-2; and Dumbarton drew 1-1 with Cowlairs. Renton were expelled during the season for using professional players, but returned to the league the following season. The SFL also deducted four points each from Celtic, Cowlairs, and Third Lanark for fielding professional players. Rangers and Dumbarton finished that first season tied for first on points. After they drew a playoff match 2-2, the SFL declared them joint champions. On 15 August 2009, 37-year old Burnley defensive midfielder Graham Alexander became the oldest debutant in Premier League history when he started against Stoke City on the season's opening day. Oddly enough, Alexander was starting his fourteenth season as a professional, having spent all of that time in England. In 1991, he signed his first professional contract with his youth club, Scunthorpe United, then in the Fourth Division. After three seasons there, he moved to Luton Town (1995-99), then Preston North End (1999-2007), before moving to Burnley in 2007. 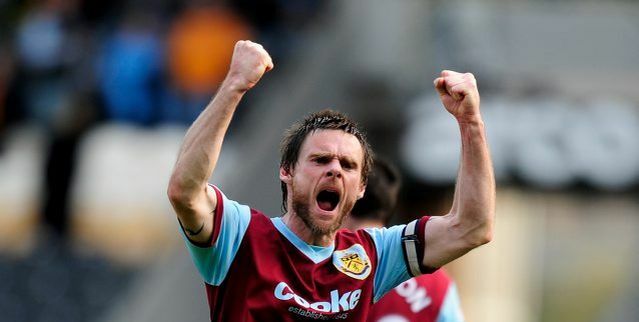 Burnley's promotion for the 2009-10 season, however, gave him his first chance to play in the English top flight. His Premier League debut was inauspicious - Burnley lost 0-2 to Stoke City and were eventually relegated - but Alexander made 33 appearances and scored seven goals. He had captained the side against Stoke that day in place of injured skipper Steven Caldwell and was named the full-time captain for the 2010-11 season. On 14 August 2001, Moldova's FC Codru Chişinău hosted the first-ever UEFA Women's Cup match, the opening leg of a qualifying tie against Solvenia's NK Ilirija. Codru won 9-0. UEFA established the Women's Cup in 2001 in response to the growing interest in women's football across Europe. It remains the only major European women's club competition and in 2010 was rebranded as the UEFA Women's Champions League, to better parallel the equivalent men's tournament. Teams qualify for the Women's Champions League by winning their domestic league (or, for countries without a league, by winning their domestic cup competition). Codru Chişinău and Ilirija were the only two teams that needed to qualify for the 2001-02 tournament, with the winner on aggregate advancing directly to the group stage. Codru left little doubt as to the winner of the tie, quickly taking a lead with a goal from Gabriela Enache in the 2nd minute. Enache finished as the day's top scorer with three more goals (23', 36' (pen), 72'). Codru's other goals were scored by Svetlana Frisko (14', 90'), Angela Toma (26'), Marianna Berinczan (66'), and Jozefina Deliu (77'). The 9-0 lead effectively ended the tie, but Codru also won the second leg 9-0, with six goals from Enache. They won their first group stage match, against Armenia's College Sports Club, by an identical score, but their dominance ended there, as they were eliminated in the group stage with losses to Levante and eventual champions Frankfurt. On 13 August 1887, Scotland's Hibernians FC and England's Preston North End met in a match billed by both clubs' football associations as the "Association Football Championship of the World decider." Hibs were chosen to participate as winners of the 1887 Scottish Cup. For some unknown reason, the English did not choose Aston Villa, who had won that year's FA Cup, but instead selected Preston North End, who had been eliminated from the FA Cup in the semifinals by West Brom. On the day, Hibernians claimed the title of World Champion with goals from inside forward and captain James McGhee and half-back James McLaren. Preston's lone goal was scored by forward John Goodall. After that match, however, the clubs' fortunes reversed. Hibs began a slow decline as Celtic became the dominant Scottish team and, by 1891, the club was defunct (though they re-formed in 1892 as Hibernian, dropping the "s"). Preston North End, meanwhile, went undefeated in 1888-89, the Football League's first season, to claim the first Double in English football. Labels: Hibernian F.C., James McGhee, James McLaren, John Goodall, Preston North End F.C. On 12 August 1904, a group including students at Rio de Janeiro's Alfredo Gomes College founded a football club they called the Electro Club. Located in the Botafogo Beach neighborhood, they eventually changed the name to Botafogo and built it into one of Brazil's most successful clubs. The idea for the new club came from Flávio Ramos, who proposed the idea to his algebra classmate Emmanuel Sodré. The two of them rounded up a group of friends, including ardent Juventus supporter Itamer Tavares, who encouraged the club to adopt black and white stripes to mirror Juve. Just a month after the club's foundation, Ramos' grandmother suggested the name change from Electro to Botafogo. The new club was a near-instant success, winning the first of their 21 Rio de Janeiro State League titles in 1907. They won four straight titles from 1932 to 1935 to secure their status as Brazil's dominant team of that era. 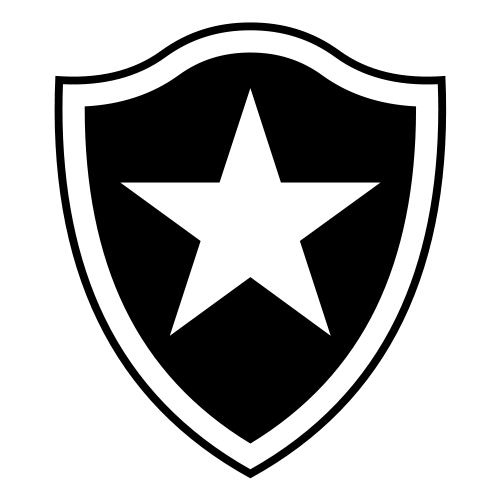 In 1942, they merged with Club de Regatas Botafogo, a rowing club, to form their current incarnation, Botafogo de Futebol e Regatas. In addition to titles, Botafogo has been the home of some of Brazil's most exceptional players, including Leônidas da Silva (1935-36), Garrincha (1953-65), Mario Zagallo (1966-70, 1975, 1978-79), and Jairzinho (1959-74, 1981-82). Despite their success, which includes three Club World Cup titles (1967, 1968, 1970), Botafogo have won the Brazilian Cup and the Brazilian Série A only once each, though they continue to do well in the Rio de Janeiro Championship, winning it most recently in 2013. On 11 August 2006, David Beckham's dream of reaching 100 caps for England appeared to be over, as manager Steve McClaren omitted the Real Madrid midfielder from the squad chosen to play Greece in a friendly. He had reached 94 caps, with his last appearance coming in the quarterfinal loss against Portugal in the 2006 World Cup. Beckham, who had captained the national team since 2000, surrendered the armband after the tournament, but expressed his desire to remain with the team. McClaren, however, had assumed control of the team on 1 August and had different plans. In dropping Beckham from the lineup for Greece, McClaren claimed that he was taking the team in a "different direction." England won the friendly against Greece, but struggled in qualification matches for Euro 2008. 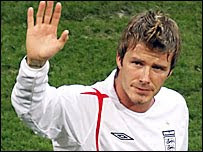 During one six-match run in late 2006 and early 2007 (including friendlies against the Netherlands and Spain), England scored only two goals, prompting McClaren to recall Beckham on 26 May 2007. Since then, Beckham has reached 115 caps, the most among outfield players and second only to goalkeeper Peter Shilton's 125. McClaren, meanwhile, was sacked after England failed to qualify for Euro 2008 and moved to FC Twente, where he won the Eredivisie in 2010. After spells with VfL Wolfsburg, Nottingham Forest, and Derby County, he took charge of Newcastle in June 2015. On 10 August 2003, Manchester City played their first match at the new City of Manchester Stadium, beating Barcelona 2-1. Nicknamed "Eastlands," the stadium was originally built for the 2002 Commonwealth Games and cost £110 million to build, plus another £30 million to convert it to a football-specific facility. With a capacity of 47,726, it is substantially larger than City's previous Maine Road ground, which was built in 1923 and seated only 35,150 (though it held a record crowd of 84,569 in 1934 when the terraces were still in use). To celebrate the move, City brought Barcelona in for a high-profile friendly and took a first-half lead with a 38th-minute goal from striker Nicolas Anelka (pictured), starting his second season with the Blues. A strike from Barça's Javier Saviola leveled the teams in the 58th minute, but City's new signing Trevor Sinclair sent a header in off the post nine minutes later to retake the lead. Andrés Iniesta almost had a late equalizer, but his shot was cleared off the line by defender Richard Dunne. On 9 August 2009, Chelsea won their fourth FA Charity/Community Shield with a victory over Manchester United. Like the 2008 Champions League Final, the match went to penalty kicks, but this time the Blues lifted the trophy. Dating back to 1908, the Charity Shield (which was renamed the Community Shield in 2002), kicks off the League season by matching the previous season's League winner against the reigning FA Cup champion. The 2009 edition had the additional intrigue of being the first cup final to pair United and Chelsea since the 2008 Champions League Final, which United won on penalties after Chelsea captain John Terry famously slipped and missed the kick that would have given the trophy to the London club. United, the previous season's League champions, struck first with a 10th-minute goal from Portuguese winger Nani. Chelsea, however, took a late lead after goals from Nani's compatriot, center back Ricardo Carvalho, (52') and midfielder Frank Lampard (70'). As the end of regulation neared, United striker Wayne Rooney netted in the second minute of stoppage time to send the match into extra time. Neither side was able to break through in extra time, so they went to penalty kicks. Unlike 2008, John Terry did not attempt a kick. Chelsea's first four shooters (Lampard, Michael Ballack, Didier Drogba, and Solomon Kalou) converted their kicks, while United's players made only one of their first three - Michael Carrick converted in between misses by Ryan Giggs and Patrice Evra - to give Chelsea the win, 2-2 (4-1). It was a small revenge for losing the Champions League, but Chelsea gained some additional comfort by winning the Premier League that season over second-place United. Labels: 2009 FA Community Shield, Chelsea F.C., Manchester United F.C. On 8 August 2006, Huddersfield Town winger Gary Taylor-Fletcher scored the 500,000th goal in Football League history, capping a 3-0 victory over League One rivals Rotherham United. It took over 107 full seasons and 170,000 matches to reach the half-million milestone, which came late in the game on the second matchday of the season for both teams. 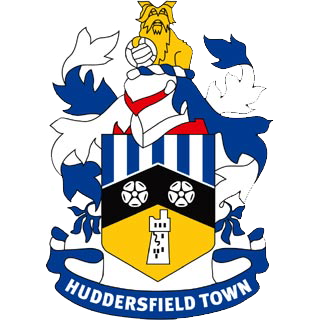 Playing before a crowd of 10,161 at Huddersfield's Galpharm Stadium, the Terriers were already up 2-0 thanks to a Luke Beckett penalty kick (36') and a goal from Pawel Abbott (45'). Then, in the 79th minute, Taylor-Fletcher sent the record strike into the top left corner of the net from 25 yards out. Taylor-Fletcher's goal was the 63rd of the day in a total of 32 league matches. It was also the first such milestone to be attributed to a specific individual, as the Football League's records did not identify scorers for the previous hundred-thousand marks. In recognition of his achievement, the Football League presented a commemorative trophy to Taylor-Fletcher the next day. On 7 August 1999, defending Belgian top flight champions KRC Genk opened their new season by drawing away with Westerlo. The 6-6 scoreline equaled the record for the highest-scoring draw in a professional match. The match included four red cards and five penalty kicks which, like the goals, were evenly distributed between both teams. The first penalty kick was scored by Genk striker Branko Strupar, who put his side ahead in the 8th minute. But Westerlo equalized with a 19th-minute penalty kick of their own from striker Toni Brogno (pictured). Strupar again gave Genk the lead with another penalty kick in the 24th minute, but Westerlo center forward Vedran Pelic scored goals on both sides of the break to put the hosts up 3-2. Brogno scored again in the 56th minute to extend the lead, but another Strupar penalty kick (66') and goals from forwards Soulaymane Oulare (72') and Ngoy N'Sumbu (80') put the defending champions back in front, 5-4. An 83rd-minute Brogno penalty kick leveled the teams at 5-5, then they exchanged goals once more, with Jóhannes Gudjonsson netting for Genk (86'), then Brogno scoring his fourth in the 90th minute to end the match at 6-6. The 6-6 draw record was set in England in April 1930 between Arsenal and Leicester, then matched by Charlton and Middlesbrough in October 1960. It was reached again by Hibernian and Motherwell in the Scottish Premier League on 5 May 2010. 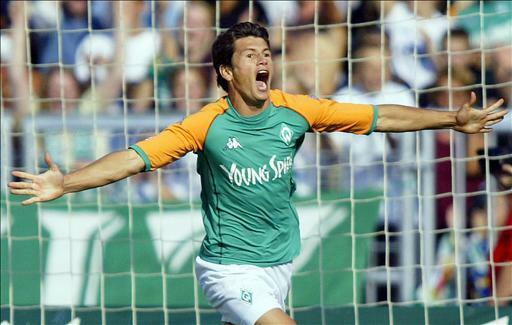 On 6 August 2004, defending Bundesliga champions Werder Bremen opened the new season with a 1-0 win over Schalke 04, thanks to the latest goal ever scored in the German top flight. Werder Bremen entered the match full of optimism, having won the double the previous season, claiming their first league title since 1993 (their fourth overall) and their first German Cup since 1999 (sixth overall). They had also won the corresponding fixture against Schalke that year, 4-1. But in the opener for the new season, the defenses dominated as both teams struggled to shows any signs of life on offense. Playing in an evening fixture, the flow of the match was interrupted when the lights at Werder's Weserstadion went on, forcing a lengthy delay for repairs. As the match restarted late in the evening, Werder Bremen manager Thomas Schaaf replaced his star forward Miroslav Klose with Paraguayan striker Nelson Valdes in the 73rd minute. Ten minutes later, Valdes (pictured) justified the switch by scoring the match-winning goal. Because of the delay, Valdes scored his winning strike at 23:13 - the latest goal ever scored in the German top flight. Despite the dramatic start to the season, Werder Bremen were unable to replicate their success from the previous season, finishing the 2004-05 season in third place. On 5 August 2009, Celtic defeated Dynamo Moscow 0-2 in the Champions League third qualifying round to advance 2-1 on aggregate. It was the first time in history that Celtic won a European tie after losing the first leg at home. They nearly didn't make it. After losing the first leg in Glasgow, 0-1, the situation looked bleak. Playing before a below-capacity crowd of 12,000 at the Arena Khimki in Moscow, the hosts appeared content to sit on their one-goal advantage. But a 44th-minute header from striker Scott McDonald leveled the aggregate score at 1-1. Celtic, who had enjoyed the majority of possession in the first half, continued to control the match after the break. McDonald narrowly missed another goal in the 62nd minute, as his shot flew just inches past the far post. In the 79th minute, with extra-time looming, manager Tony Mowbray replaced McDonald with striker Georgios Samaras (pictured). The Greek striker quickly repaid Mowbray's faith with a stunning bit of athleticism, dribbling through three Dynamo defenders to notch the tie-winner in the 90th minute. It was the first time in the club's more than 220 years of history that they won a European tie after losing the first leg at home. The euphoria did not last long, however, as Celtic were eliminated from the competition in the next round by Arsenal. 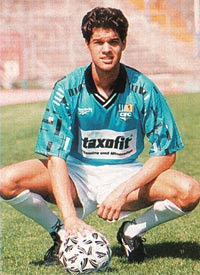 On 4 August 1995, 18-year old Michael Ballack made his professional debut for 2.Bundesliga side Chemnitzer FC. He would go on the become a three-time German Footballer of the Year, winning four Bundesliga titles and one Premier League title. Chemnitzer lost Ballack's first match, 2-1 against VfB Leipzig, and were relegated at the end of the season. Ballack remained with them for one season in the third division, then moved to the top flight in 1997 with Kaiserslautern. He spent two seasons with Kaiserslautern, winning his first Bundesliga title in 1998, then played three seasons for Bayer Leverkusen (1999-2002) before moving to Bayern Munich. He enjoyed his greatest success at Bayern, winning league and German Cup doubles in 2003, 2005, and 2006. In 2006, Ballack moved again, this time to Chelsea FC, helping the Blues to the FA Cup in his first season. Another FA Cup followed in 2008, the same year Chelsea advanced to the Champions League Final, then he won the fourth double of his career with the 2010 FA Cup and Premier League title. Ballack returned to Bayer Leverkusen in 2010 and retired two years later.